Every year, tens of thousands of Canadians end up sick from infections. In fact, infections - both bacterial and viral - are among the top five reasons why Canadians end up in a hospital emergency department or in their doctor's waiting room. That's because infections are at the root of any number of serious and not so serious diseases, ranging from the common cold and norovirus to methicillin-resistant Staphylococcus aureus (MRSA) and influenza. In addition to leaving many people sick, infections also take a toll on the economy, costing billions of dollars every year in terms of lost production and treatment for those who fall ill.
And yet, many of the infections that afflict most people are actually quite preventable. They only continue to flourish, in part, because many people don't realize just how deceptive these germs can be and how easily they can spread. Cold and influenza viruses are good examples. Both viruses are transmitted through the air in tiny droplets whenever an infected person coughs or sneezes. And while most people know not to stand next to someone exhibiting symptoms such as a runny nose or cough, they sometimes forget that they can also catch the flu or a cold virus in other ways, such as touching a contaminated surface and then touching your eyes, hands or mouth. Studies show that these viruses can survive on surfaces for 24 to 48 hours. So, if an infected person coughs into their hand and then touches a door knob at the office, a lunch counter at the mall, or a handrail on a transit bus, chances are they will leave behind germs that can be picked up by the next person coming along. In some cases, people can spread a virus without even knowing it. 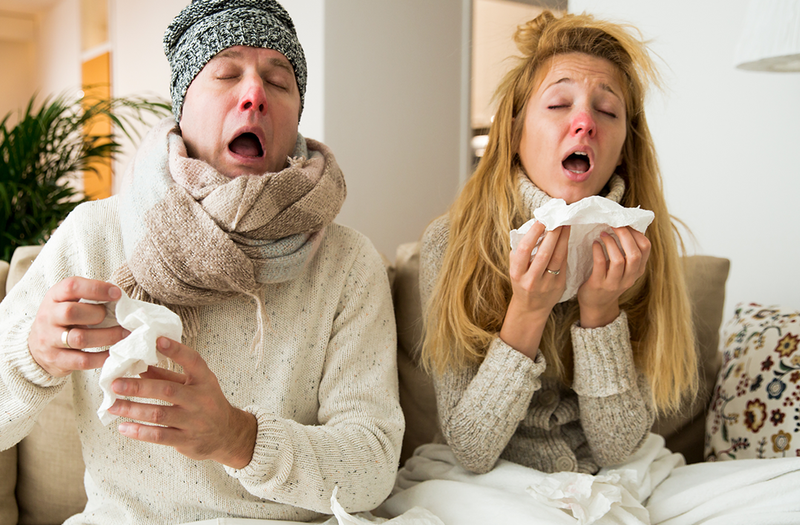 People carrying the flu virus, for example, are most contagious before they actually experience any symptoms. And it is not just the common cold or influenza viruses that can cause you grief. Germs are everywhere, and while some may be beneficial (like those found in our digestive tracts), others can be very harmful. Take norovirus. Every year in Manitoba, hundreds of people become infected with this virus, also known as the stomach flu. Symptoms can include nausea, vomiting, diarrhea, abdominal pain or discomfort, and a low-grade fever. In more serious cases, it can even cause death. Norovirus can be found in the stool or vomit of an infected person and is easily spread by physical touch. Unlike some germs, norovirus can hang around on various surfaces for days to weeks, making it difficult to contain. That's why it tends to be found in areas where people are in close contact, including daycares, personal care homes, schools, and, of course, cruise ships. MRSA is another deceptively troublesome infection, particularly for those who are ill. It can complicate treatment for patients with multiple health issues, and can be potentially fatal. Yet some healthy individual infected with MRSA may not have any signs or symptoms (no infection). This is called MRSA colonization. So although these people are healthy, they can still spread MRSA to others. Clean your hands. 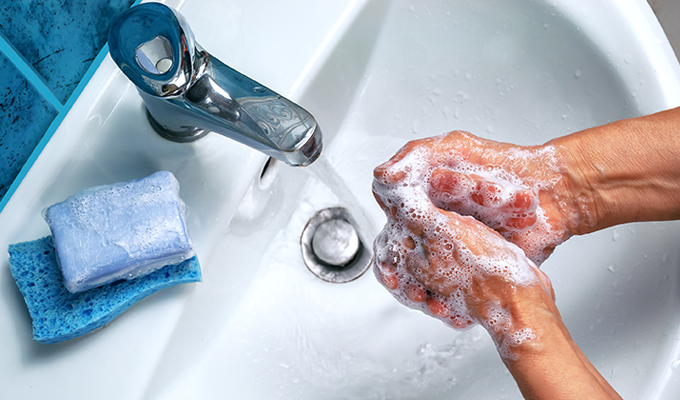 You may clean your hands in the morning, but by the time you get to work, you will have probably touched a half-dozen surfaces that could be contaminated with one germ or another. It is important to clean your hands frequently during the day, using soap and water or alcohol-based hand sanitizer. Both are equally effective, but if your hands are visibly soiled you should use soap and water. Don't cough into your hands. If you must cough, do so in the crook of your elbow or use a tissue. And if you use a tissue, wash your hands as soon as possible. If you cough into your hand, you can spread your germs to others by touching various surfaces, such as door knobs, computer keyboards, elevator buttons or telephones. Don't visit anyone in hospital if you are sick. People in hospital are vulnerable to infections. And even if you are not ill, take care to clean your hands frequently. Remember, you could be carrying harmful germs without showing any symptoms. Likewise, stay away from work or school when feeling ill. Cleaning your hands might just save a life. Chantelle Riddle-Yarycky is a community infection control professional with the Winnipeg Regional Health Authority's Infection, Prevention and Control Program. This column was originally published in the Winnipeg Free Press on Friday, August 24, 2018.